(Nanowerk Spotlight) In a previous Nanowerk Spotlight – "Nanotechnology that will rock you" – we reported about work by a group of Chinese scientists that demonstrated that carbon nanotube sheets can act as powerful thermoacoustic loudspeakers. A very important difference between conventional and thermoacoustic loud speakers is that the latter can operate non-resonantly. The most efficient piezo-ceramic transducers with perfect impedance matching decrease the energy by 3 or 4 orders of magnitude when the frequency deviates 10% from the resonance frequency, while the thermoacoustic transducer has a flat spectrum in the low frequency region, 1-100 kHz. Moving experiments with carbon nanotube loudspeakers from air into water, researchers at the University of Texas at Dallas (UTD) have now observed surprisingly high underwater sound generation efficiency using multi-walled carbon nanotubes (MWCNT) sheets that are self-supported or attached to porous tissue. As a matter of fact, the nanotechnology speakers perform as well underwater as they do on land. "The most surprising result we observed is that the carbon nanotubes immersed in water can still generate sound thermo-acoustically at frequencies 1 Hz - 100 KHz, despite the huge thermal capacity of water and its low thermal expansion," Ali Aliev tells Nanowerk. "The theoretical calculation predicted poor performance of thermoacoustic projector underwater. However, our guess that hydrophobicity can help to reduce the high thermal inertia of interacting system was confirmed." 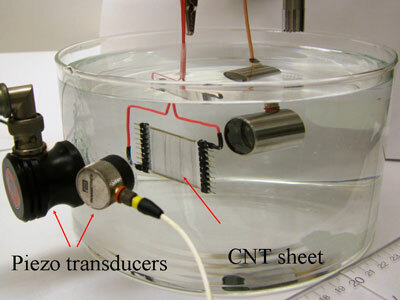 Aliev, a Research Scientist at the Alan G. MacDiarmid NanoTech Institute, Adjunct Professor at School of Natural Sciences & Mathematics of UTD, together with Ray H. Baughman and members of his group reported their findings in a recent issue of Nano Letters ("Underwater Sound Generation Using Carbon Nanotube Projectors"). Aliev explains that his team's findings are based on extremely high hydrophobicity of large diameter carbon nanotubes. "The extremely high hydrophobicity of carbon nanotubes to water creates a thermally insulating layer around the nanotubes – the repulsion of water molecules (highly polar) from the non-polar carbon surface results in a tiny air envelope around the nanotubes. This layer thermally insulates the nanotube from direct contact with water and allows it to rapidly heat up and cool down when the current pulse is applied, thereby producing expansion and contraction of air envelope around the nanotube." This incredibly quickly heating and cooling of nanotube sheets produces a pressure wave in the air around the nanotube that our ears and other devices perceive as sound. The researchers point out that various aspects – the light weight; transparency to acoustical, thermal and optical waves; flexibility; and scaling on large surface areas – makes the carbon nanotube projectors very attractive for various underwater applications. "However" says Aliev, "the main advantage of thermoacoustic sound generation is the complete elimination of vibrating parts. This makes the system non-resonant. The consequence of non-resonant sound generation and thermodynamic response is the smooth spectra in wide frequency region, from infrasound (1 mHz) up to ultrasound (100 kHz). This advantage can encourage the use of frequency-domain signal treatment (frequency and phase modulation) for underwater sonar system and underwater communications, which is so successfully used in radio-engineering." Currently, the upper sound generation frequency is still limited by carbon nanotube bundling but the team is working on this problem and hopes to rise this edge up to hypersound domain. Since the carbon nanotube film is extremely thin, light, and flexible, it can be deposited on any curvature surface to provide negligible addition to the mass of the system. It would also be easy to create large size projectors in the square meter range with confocal, cylindrical or semi-spherical forms with thickness less than 1 mm. "The corresponding gravimetric capability for acoustic power projection into air, based on nanotube sheet weight, is a remarkable 0.66 kW/g, which suggests the possibility of using thin encapsulated nanotube sound projector skins for control of the boundary layer losses for air and marine vehicles," says Aliev. What this means is that, by periodically heating the skin of a submarine – or even an airplane – warms the thin pocket of air around the vehicle and reduces friction and turbulence; in effect making them more fuel-efficient but also less detectable. Military types certainly will have a look at this technology.